I currently spend my days at home with a joyful, adventurous son who paints the world with rainbows. We bake, trudge along muddy paths, paint, and explore the world. I drink several pots of tea a day and have more pretty aprons than anyone could possibly need. While nothing beats neighborhood trick-or-treating, the Denver metro area has many Halloween activities that are suitable for families with children. From slightly spooky Halloween celebrations to harvest themed activities that are suitable for families that choose not to participate in Halloween, there is something for everyone. This year’s events involve everything from bugs to bounce houses. Carnival games, barrel train rides, food trucks, face painting and crafts make this a fun event. Pick out and purchase your pumpkin from the large pumpkin patch. The corn maze requires you pay an additional fee, but it is well worth it. Our family hasn’t attended this particular event yet, but past experience with Denver Botanic Gardens Christmas events leads me to believe it will be a good one. Illuminated pumpkin displays, crafts, music, music, and pumpkin carving provide options for families. There will be 2 costume contests each evening and seasonal snacks and drinks are available for purchase. This little garden is decked out wonderfully for Halloween. My little one loves it. It’s also a good place for parents to snap some fun pictures of their little ones. It is a bit crowded and dlast year, but this event is a fun one for little ones. There are carnival style games with Halloween treats as prizes. The hot air balloons in the night sky are a fun night for adults and little ones as well. The Butterfly Pavilion is all decked out with spooky Halloween decorations for Bugtober, a month long event including a spider pavilion exhibit and a forensic entomology exhibit. Bug-A-Boo brings additional fun with trick-or-treating and a costume parade. This is an old favorite of ours. The museum is all decked out in spooky finery and there will be a lot of opportunities for cute photographs. There are carnival games, crafts, and trick or treating booths. In the past, some of the treats have been nice snacks, like popcorn or yogurt. For $2, your child can ride the mini barrel train as well. This event is great for those who don’t observe Halloween, but all families can find something to enjoy here. The harvest theme makes it less spooky and a good fit for younger children. There are bounce houses, pony rides, and carnival games. There is a lot to do here, so it is also a good place to avoid eating too much candy. I have found that healthy community is vitally important when you’re raising children. It gives your child a sense of stability and gives parents the support and companionship they need on their journey. When I first had a child, I found I needed to form new friendships, because many of my friends did not have children. It proved more difficult than I anticipated. When I first became a mother, I felt like I was back in junior high again. I was surrounded by cliques and gossip. My reaction in junior high was to simply hide in a book and wait for adulthood. The problem is, this time, we were the adults. I had no idea what to do. Over time, I’ve crafted my own strategy. I focus on nuturing good friendships and devote my time to them. Strong, kind, secure women deserve my time and support and will provide the same in return. I also have some rules for my own conduct I try to follow when possible. I cannot control others, but I can strive to meet my own ideals and set the right tone for my relationships. 1. Be your genuine self. Moms form their little tribes and try to fit a list of rules about how they are to conduct themselves. There are the traditional moms, the crunchy moms, the attachment moms, and a myriad of other categories. No one fits any of these perfectly, and categorizing ourselves can be a way of excluding others. It can also lead to making parenting decisions for other people, and not choosing what’s best for us and our family. A good mom friend will be ok with your differences. 2. Try not to judge. I have pretty strong feelings about a lot of my parenting choices. They are often deeply personal or based on hours of research. There is a temptation to judge. Sometimes I do, in spite of my effort to avoid it. If someone hurts their child physically or emotionally, I might make an exception, but there are a lot of healthy ways to relate to a child. I don’t know another mom’s family or situation as well as she does. I also come with my own set of cultural values that might vary from hers. Little, cutting remarks are judgemental, too. A struggling mother doesn’t want to hear “Well, my child never does that.” If you think you have a helpful solution, by all means offer it, but realize that your situation and your child might be very different. 3. Make other mothers comfortable. Share words of affirmation. Be kind. Reassure them. Validate them when they need it. If their kid are acting up, smile kindly and ask what you can do to help instead of making them feel awkward about it. Always be ready to offer a cup of tea and a chat. Parenting is hard, so do your best to be a kind ad reliable ally. It is hard to know when to talk about issues or differences. Sometimes large issues will crop up and need to be addressed. If Joey next door has been watching violent TV and reenacts it in front if your preschool kid, you might be right to be concerned. Talk about it kindly and without judgement. His mom probably needs to know. Hopefully, she’s adult enough to have a productive conversation about it. If my kid had a similar problem, I would want to be told politely and respectfully. In mom circles, we tend to talk about people behind their backs or deploy passive aggressive tactics to control their behavior. This leads to an atmosphere of distrust and dishonesty. People with good, strong friendships can talk to each other about concerns like adults. If you have a friend who does not do this with you or who you are afraid to talk honestly with, reconsider that friendship. Our friends need to be trustworthy and reliable. Mom cliques cause another problem. Not only do we have immense pressure to fit in, we might find ourselves excluding others. While it might be natural and easy to do accidentally, when we exclude others, we rob ourselves of the richer interactions that come from a diverse group of friends. We are also modelling something we probably would not want our children to do. That mom with a child with special needs might be having a different parenting experience than you, but I bet you could learn a lot from her. That single mom working two jobs to keep her kid fed might not be able to do the fancy mom and toddler class on a workday with you, but she might be able to go to the park on Saturday morning. It is important to get to know people who aren’t exactly like you. It will keep you grounded, and your life will be richer for it. I also find a quiet sort of classism has seeped into a lot of parenting culture. People who do not buy the right food or the right toys are looked down upon as inferior parents. I’ve done it myself. We’re surrounded by ads suggesting we need more expensive products to make the best choices for our little ones and it is very hard to escape that message. As a middle class mother I can make choices others cannot and the quality of my parenting doesn’t depend on my consumption. I have seen women excluded because of this and I think it is another thing we have to strive to overcome. Parenting is hard. Mothers work long hours, give of themselves all day long, and are under immense pressure to be perfect. While I know I make mistakes, I believe we should all do our best to encourage and stand with each other. Kindness and inclusion build healthy communities, model good values for our children, and provide us with a sense of acceptance and stability. 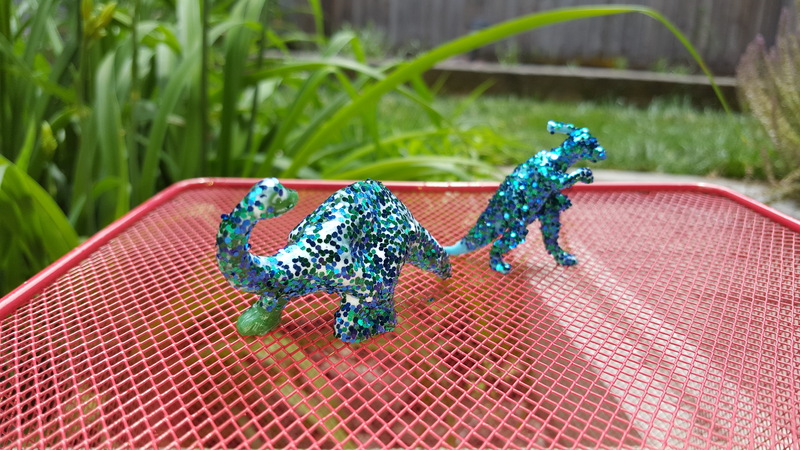 Repurposed plastic dinosaurs are all the rage lately, so when we scored a large bag of vintage plastic animals and dinosaurs at the thrift shop, I thought we’d glitter them. While most adults would probably use glitter spray paint, I’ve found Mod Podge and a jar of glitter make a more fun, involved craft for kids, without the perils of using spray paint. Because it involves small children and glitter, I’d recommend doing this project over a drop cloth or a surface that’s easy to sweep. 1) Scrub your toys with a good dish soap to create a clean, oil-free surface for your glitter. (Kids love this part.) Let your animals dry before continuing. 2) Paint your dinosaur with Mod Podge. Encourage your child to cover the whole thing and use an appropriate amount of glue. If they don’t, that’s alright, too. The results will be interesting but it might take awhile to dry. 3) We do this over a box, so if my child uses too much glitter, I can simply pour it back into the jar. 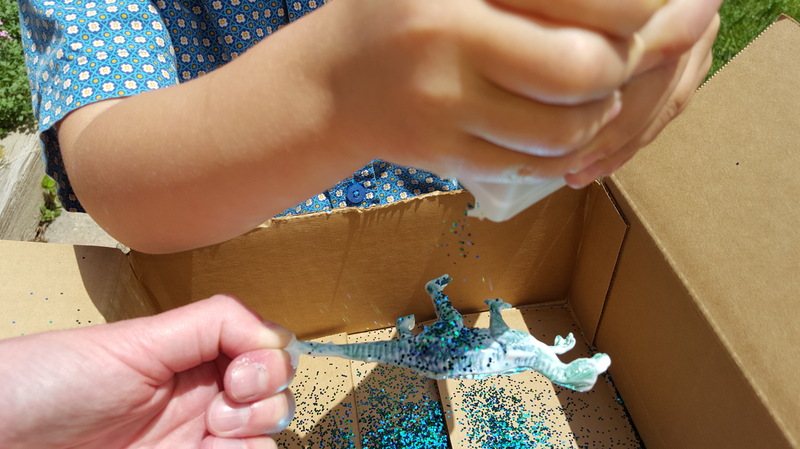 Over the box, hold the dinosaur by a narrow part and allow your child to cover it in glitter. Turn the dinosaur until the part you are not holding is completely covered or your child is satisfied with it. A smaller child might not be as thorough, but they will still likely be pleased with the result. 4) I used a mesh basket to dry our dinosaurs. A wire shelf or wax paper are also likely to work well. The drying time largely depends on how much glue was used. You can touch one gently to see if they are done. 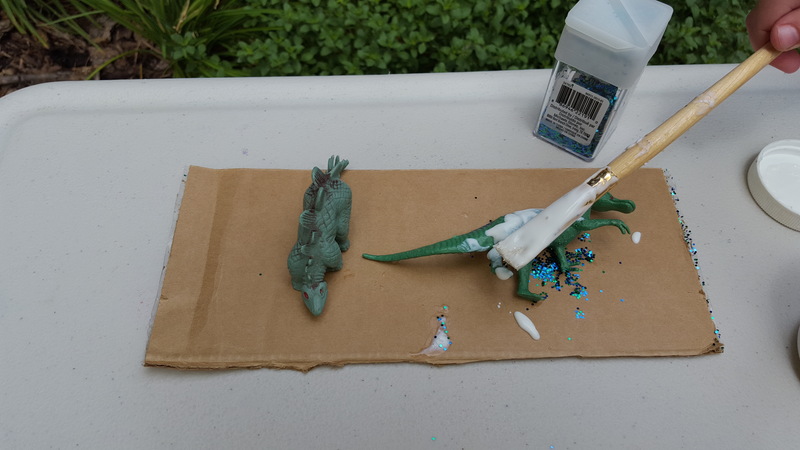 5) When they are dry, ask your child to paint glue on to the part you held the dinosaur by. Add more glitter. 6) You can seal your dinosaur with a bit of Mod Podge when it is very dry. I recommend that an adult do this, very gently, using a sponge brush or the tip of your finger. Press it down, rather than brushing across it, or you will brush off the glitter. The Mod Podge is dry when it is clear and no longer milky. These little guys are great for other art projects. We’ve used them to make tiny scenes, and to decorate gifts. Our family likes to attend local festivals, and every summer presents us with a myriad of choices. While I do like to expose my child to new experiences, I think consistency is also good. We have gone to the Cherry Blossom Festival since before he was born, and he seems to enjoy his experiences there. It is held at Sakura Square, which houses Japanese businesses, like the grocery store I frequent. The experience has changed a bit since we had a child, and it’s wonderful to see our little one discover new things and revisit familiar ones. Today, when we arrived, we were greeted by the sound of taiko drumming. We pursued some of the shop stalls and slowly made our way to the stage. Yesterday morning there were musical performances and dances. Our child must have liked the dancers best this year, because he wouldn’t stop talking about “the girls with the fans” and how pretty their dances were. In past years, he has been most fond of the taiko drummers. They had a kid’s craft area with three stations, something we did not notice in previous years. On a hotter day, I’m sure it would be a welcome respite from the sun. There were three stations, one for making a cherry blossom card, one for making a paper representation of a kokeshi doll, and a coloring station. Our little one chose to do the cherry blossom and kokeshi doll crafts. The volunteers were very sweet and helpful, and he was excited to use a stapler for the first time. Afterward, we went into the Denver Buddhist Temple building for snacks. We had a talk about how we behave in church before we went in, because I think it is always important to respect other people’s space. Inside, they had sushi and teriyaki meals, green tea, and a few sweets to choose from. He was thrilled when he was allowed to choose his own treat and selected a plate of pretty, pink mochi. Inside the temple they also had ikebana and bonsai displays as well as talks on Buddhism . I think any or all of these could be useful teaching opportunities for older children. While our child is much more interested in the new sounds, sights, and flavors, there is definitely more of interest for older children and adults. The Denver Cherry Blossom Festival is a good choice for young children. It is small enough to navigate easily, and there are interesting performances, fun snacks to try, and crafts for little ones. Children will have different experiences at the art museum depending on their ages, temperaments, and interests. It’s probably easiest if you can set aside your own expectations. They will engage with things in the way that is appropriate for them, and they might learn something entirely different than you had in mind. That’s ok. What’s important is that it’s a joyful experience and they want to come back. A good relationship with art, and museums in general, is a gift that will far outlast a particular lesson you had in mind. When you arrive at the museum, check in and make sure your child understands the expectations you talked about. Talk to the staff about what resources for children there might be, any current temporary exhibits your child might be interested in, and what they recommend for children. If you can include your child in this conversation, that will help them get excited about their trip. You might have a fair idea of what your trip is going to look like, but I find it useful to grab a map, explain it to my child, and ask what he wants to see. If I have chosen particular things I think he will be interested in, I explain why. If there is a play area or something else you think might be distracting, suggest seeing it after you finish another exhibit. I find that breaking up our trips with play, painting, or time outdoors helps lengthen our stay and makes it more enjoyable. Children need to move. This is also a good time to talk about when you might have lunch or a snack, if that is part of your agenda for the day. 3. Ask your child questions. Talking to children about art isn’t as hard as it sounds. It helps to start with questions that have no right or wrong answer. “How does this make you feel? Why do you think it makes you feel that way?” has led to some very useful conversations with my child. I sometimes simply ask what he thinks is going on or why he gravitates toward a particular piece. He responds more thoughtfully to abstract art right now, and I suspect it is because there are fewer cues about what he’s supposed to think. It is very important for your child to understand that the ideas and feelings they bring to a piece matter. That is why I start with broader questions with no right or wrong answer. However, art, especially historical art, often has its own special language you can help your child decode. If you are looking at Buddhist art, it might be interesting to talk about mudras, the hand gestures often used by the religious figures depicted. If you teach your child a few, and teach them what they mean, it will lead to a deeper understanding of art. Mine also thinks it’s ridiculously fun to spot and identify them. In Western art, saints are often depicted with certain things to indicate who they are. These things often tell a part of their stories. Teaching your child to recognize a few of them might help them engage with the pieces on a deeper level, and they might have fun spotting them in the gallery. Flowers and plants may also carry meaning. If a plant your child is familiar with from your garden at home carries meaning, that might be a fun place to start. If you need to brush up on your art history a bit, museums often provide a little information about the pieces. I sometimes scan it and share interesting things with my little one, For older children, talking a bit about historical context might also bring depth to their experience. Pay attention to your child’s signals. Are they really interested in something? Talk about it more and try to find similar things to look at. Are they bored? It might be time to move along. The best time to learn about the things the museum has to offer is when your child is happy, excited about the experience, and feels well. If your child isn’t happy, it might be time to break up the experience a bit. We find outdoor spaces to walk in, have a snack, or play with interactive exhibits. A child simply does not have the same sort of attention span an adult has. Your museum visit should be fun and not feel like a chore, so it’s important not to drag a kid along when they’re not happily, actively engaged. I often find that changing our activities up a bit allows my child to stay actively engaged for longer periods of time. One of the main things I hope to give my child is a joyful appreciation of the world around us, and art is a very important part of the human experience. I expect his appreciation for art and ability to find joy and comfort in it will grow with time. While it might be awhile until he can spend 5 hours at the Louvre and talk about art history with me, it is important for him to be able to tell me that a painting of sunflowers makes him happy because they’re yellow. That sort of experience is, perhaps, more important than a more complex, intellectual understanding of art. Taking children to art museums can be daunting, but we find it fun and rewarding. It has taken some practice, as they are often an unusual environment for children. Kids might not know how to enjoy themselves or behave in a way that is appropriate to the environment. A little preparation can make it a much smoother, more joyful experience. With some practice, our local art museum has become my child’s favorite place to go. Find out how child friendly the space is, if there are any children’s play areas, if there is a café or place to eat a sack lunch, and what sorts of opportunities there might be for a break. An energetic child might do better if you know where they can have a quick walk outside or a visit to a play area. My child also sometimes needs a quiet break for a cup of steamed milk and a discussion of the things we’ve seen and learned, so knowing if there is a café or place to picnic can also be handy. Kids thrive when they know what to expect, and talking about an experience before you have it is often a good way to make them more comfortable and get them excited. Talking about what you’re going to see beforehand will help them settle in and engage with the art more quickly. Because my child is still fairly young, I established the expectation that we are going to hold hands in galleries. I explained that even the gentlest touch can harm the art and that lines on the floor and ropes in front of things mean he is not supposed to step beyond that boundary. Everyone should be able to enjoy art, so we have to take care of it. All of these rules about being careful can make art feel a bit unapproachable, so I try to find art we are supposed to interact with whenever I can. Like libraries of old, art museums are generally hushed and calm, and some children may have trouble adjusting to such a quiet environment. We talk about it beforehand. If your child frequents another space, such as a church, where they are used to using a quiet voice, that is a good comparison to make. I remind my child that we can talk as much as we want, we just have to use soft voices, so that the people around us can have their own experiences with the art. Find out what resources they have for kids. Art museums nowadays aren’t always the quiet, imposing places they were when we were children. They often have painting spaces, interactive exhibits, or maps tailored to little ones. Our local Denver Art Museum has little art spaces for kids throughout and offers backpack for families that help make the experience more child friendly. Other museums we have gone to have had painting areas, special maps, or play spaces intended for children. Remind your child that art is fun and for everyone. In some of the more stern, cold spaces where art finds its home, it can be easy for a child to think it is for grownups. Remind your little one that art is for them. Talk about some of the different ways you make art at home and how you experience art in everyday life. My husband is from a different country and a different culture. He grew up celebrating a lot of the same holidays I do, just in a slightly different form. He also grew up celebrating a few ones I never knew as a child and have had to learn about as an adult. I use a lot of books and Google searches to come up with ways to celebrate them at home. I also often use the book Moonbeams, Dumplings, and Dragon Boats to come up with a few quiet ways to celebrate holidays at home and teach my child about the other half of his culture. Today is Dragon Boat Festival, which traditionally involves boat races and rice dumplings. The story of the holiday might be rather dark for young children. Qu Yuan, a statesman, threw himself into the river to drown out of loyalty to the king. People rushed out in their boats to find him, and when they failed, they threw rice dumplings into the river so that the fish would not eat his body. The racing boats and rice dumplings are key elements of the holiday. My child is a bit too young for this story, so we focus on the boat races and delicious dumplings. The Colorado Dragon Boat Festival is an exciting celebration for kids, complete with dancing, food, and dragon boat races, but it takes place later in the summer. We attend it most years and my son absolutely adores the boat races and aspires to participate in them when he’s bigger. It’s an excellent way to spend a hot summer day. It doesn’t solve the problem of what to do on the actual holiday, however. The traditional rice dumplings, or zongzi, might be a bit difficult for a busy parent to replicate. They’re time consuming, and I find them a bit hard to wrap. With an older child, they might be fun to attempt as a family project. The MeatMen, a Singaporean food blog, has a guide to making kee chang, a rice dumpling filled with red bean paste, for those who are feeling brave and adventurous. There are a lot of other lovely variations you can make as well. If you’re like us today, you can buy zongzi fresh or frozen in Asian grocery stores and bakeries as well. Frozen dumplings can be cooked easily at home in a steamer. 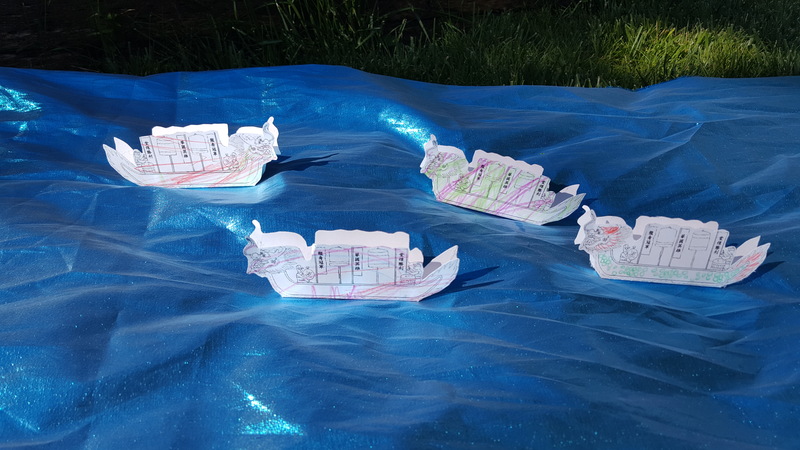 My son and I set up a pretend paper boat race on a fabric river in honor of the holiday. We downloaded and printed a template, he colored it, and I used hot glue to hold it together. I glued rice to the bottom to give more weight and stability but I suspect small gravel or sand would work better. We used the sheet of metallic fabric we often use as a body of water and put the boats in the river. We’ve also had a lot of fun racing them across the sofa and other surfaces. Celebrating a different culture’s holidays has definitely been a challenge for me. 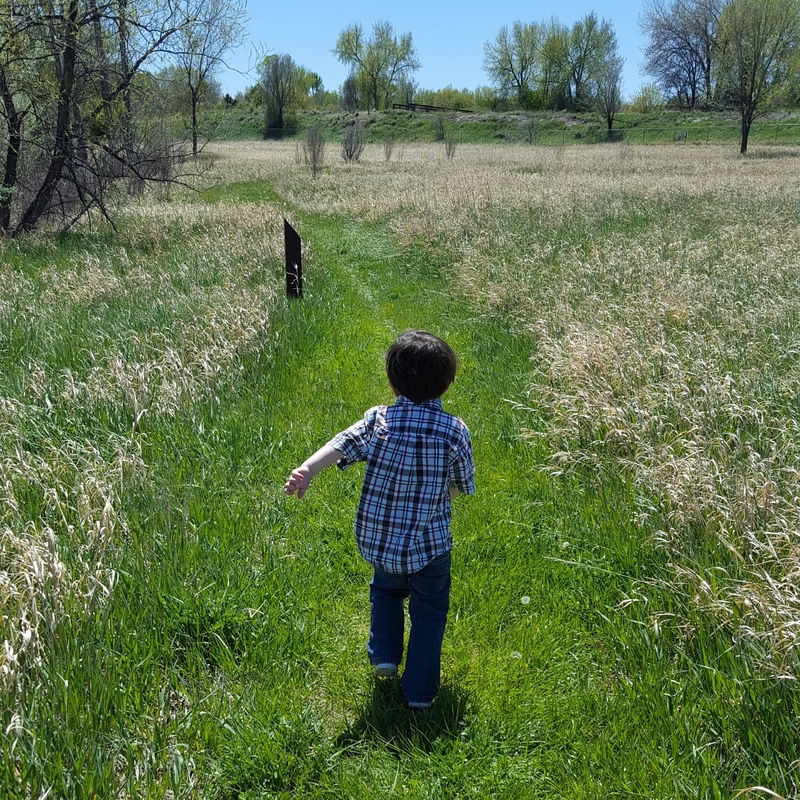 Initially I was very intimidated by it, but as my child has gotten older and more curious and excited about the holidays, I let his curiosity lead our explorations. The little paper boat races have definitely been a success, and he loves rice dumplings. While the story is definitely one for older children, I can tell him that the holiday is a celebration of loyalty, since that is a quality I want him to value. I’ve always been intrigued by nature art made by arranging flower petals and other natural objects. My child didn’t exhibit much interest in making any, but I had a feeling he’d love it if he gave it a try. Since some of my bright spring blooms somehow survived the snow, I decided to use them to set up an art invitation in our yard. Single out a few garden flowers you think will work well and snip the blooms off, placing them in your containers. I chose flowers that were starting to fade because I couldn’t bear to pick the new blossoms. (And my little one would have scolded me about taking food from the bees.) This is also a good activity for when you have a lot of garden trimmings. Gathered up and presented neatly, garden trimmings can be an inviting material for art and play. Arrange the flowers near your flat surface. I also added a pile of small sticks, as they are useful for forming shapes. Pebbles or gravel might also be good additions if you have them on hand. Make an example of flower art on your flat surface if you don’t think your little one will get the idea. I chose to make a butterfly. Invite your little one to come look and make their own art. I think my child felt a bit intimidated by my example. He made several pieces that he didn’t find satisfactory and eventually gathered his materials, slid behind the house and replicated my butterfly in a basket. A better idea might have been to show him a few pictures of this sort of art, or simply as him what he thought he could make from the different types of flowers. I have presented him with this art invitation a few times since, and he has had no problem coming up with his own creations. He’s made birds, bugs, and simple flower mandalas thus far. He has also helped me gather materials for this project, using a blunt tipped pair of scissors and a little bucket. This definitely adds to the fun if you have a little one old enough to use scissors and understand what to cut with them. You can create a lot of variations of this project, depending on the season and the materials you have at hand. Sticks, rocks, and snips of evergreen would work well in winter when there aren’t a lot of plants to choose from. In autumn, seeing how many colors of fall leaves you can gather and using them to make pictures would be a wonderful way to embrace the change of seasons. My little one likes to be outside more often than not. I initially thought I had do to do elaborate hikes with him, or take him to exciting places, which I found so daunting that we didn’t get out as much as we should have. Recently, I ventured out with him to see what we could find nearby. I’ve found that a simple walk in a wild space usually satisfies his need to explore and, even if we don’t venture far, we discover a lot of new things. I managed to find a wildlife preserve, some open spaces, and the wooded area around our neighborhood lake for us to explore. I’ve had luck looking at the city’s parks and recreation page and asking around for new places to go to. My little one prefers spaces with a variety of wildlife, but I’ve found he is just as interested in meeting a new variety of spider as he is in a family of deer. If I hear the chatter of birds or bugs, we’ve found a good spot. While I often bring a bag with a few tools to make the walk more interesting, there is a lot we can do without help. Children will often initiate their own activities. 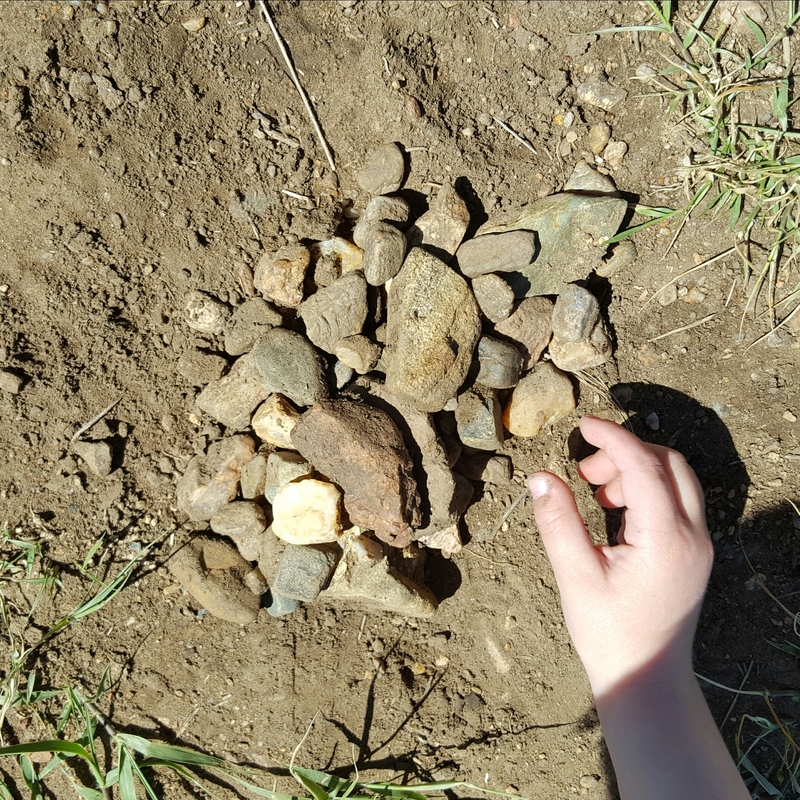 On a recent outing, my child gathered a pile of small stones, fashioned them into a little picture, told me a story about the picture he had made, and scattered them about when he was done with them. If you go slowly and let your child do things that interest them, you might not need to do much at all. Finding and identifying things is another simple way to hold a child’s interest on a nature walk. On a recent trip to the wildlife refuge, we saw a red winged blackbird. I told him what it was. It was distinctive and easy to identify, and he proudly pointed out several more on our walk. With a little guidance, a simple walk through a wild space can hold all sorts of wonders. It doesn’t have to be fancy or difficult, and it might be as simple as asking a few questions, pointing out a few new things, or waiting paitiently while your child finds their own interests. You just need practical clothes, a waterbottle, and your kid. My little constantly tries to make ponds in his sand bin. It never works very well, so I decided he might need better tools. I gathered wax paper, aluminum foil, and some plastic packaging from some craft supplies we’d bought. You can cut out pond shapes from your materials or let your child cut them. Ask them to dig ponds in sizes they think correspond with the shapes and sizes of their ponds. Ask your child to set up a pond. If the water trickles out, ask them why they think it’s happening. Ask how they might fix it. 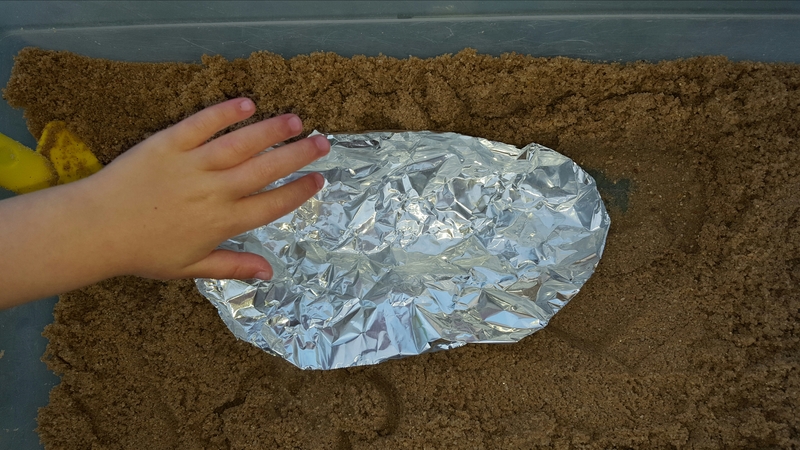 My child realized the ends of his foil pond weren’t elevated enough and added sand underneath. 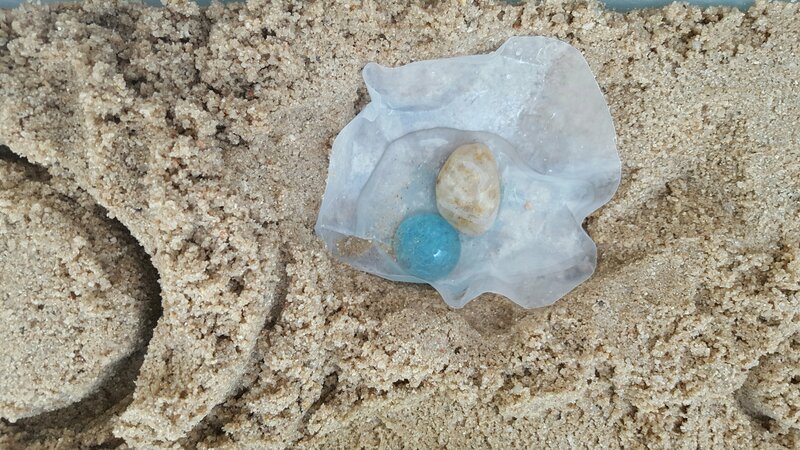 His wax paper pond needed to be weighed down with stones. Try to ask questions and encourage your child to use the materials available to solve problems with their ponds. Once Peanut got the hang of it, he experimented with different configurations and amounts of water. He really got to exercise his problem solving skills, and, once he was pleased enough with one of his ponds, he added a boat. 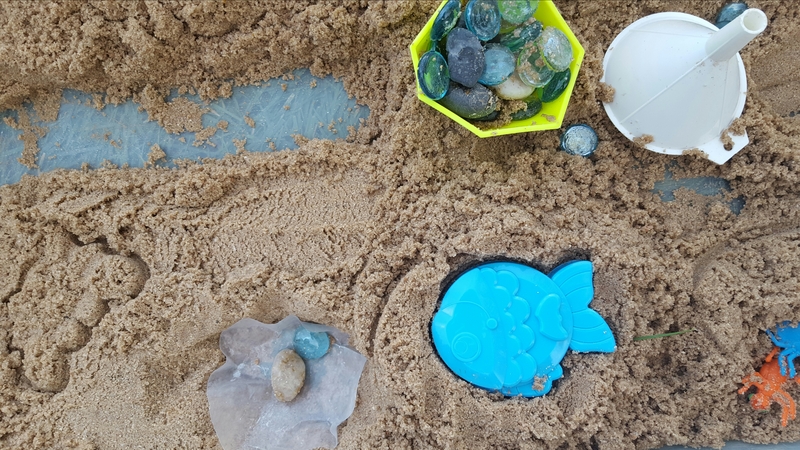 This activity was definitely a success, but if your sand play area doesn’t have good drainage, it might be wise to limit the amount of water available. Ours took a few days to dry out after we were done with this activity.